1. 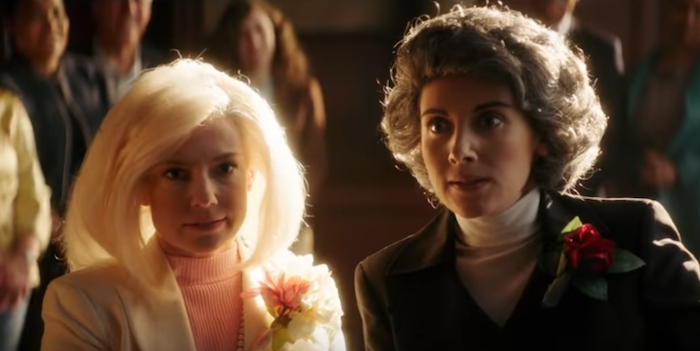 Edie Windsor and Thea Spyer get the Drunk History treatment. This week, the popular historical re-enactment show, Drunk History, took on Edie Windsor’s lawsuit against DOMA and the federal government. Windsor and Spyer are played by Sugar Lyn Beard and and Alison Brie, respectively. 2. Girlship TV unveils a new short film about internet dating. Whale, Hello There is a sweet short written by Amanda Holland and directed Chantel Houston about two women who meet on a dating app, but find it a bit of a challenge to talk face to face. 3. Batwoman has found her villain and she’s a familiar face. Rachel Skarsten, who played the lovable bisexual valkyrie on Lost Girl, is stepping into Alice’s shoes opposite heroine Kate Kane (Ruby Rose). 5. Killing Eve? More like Thrilling Eve. We finally got a taste of S2 of Killing Eve, which we also learned takes places immediately after the events of S1. This season delves even further to the mutual obsession between the two women.